Final round at SRCC on February 10th. Selection Panel: From Google-India, Walmart-Asia, Headstart Netwrok and National Foundation-India. 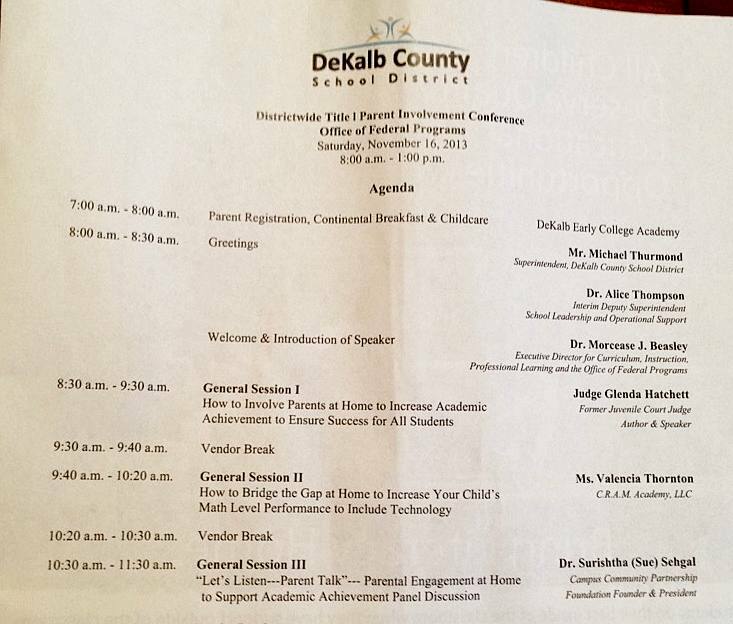 Mentor Walk-2015 at Atlanta Technical College. Agnes Scott College, October 31 for girls. Annual Mentor Walk was held at Georgia State University on September 20. Project # 1:helps under privileged women become self reliant with paper art-collaboration between LSR College, SGGSC, Shivaji and SPM College; Project # 2: Food preservation in villages with food coolers-Hansraj college- Delhi University and Project # 3 where women are empowered through production of low cost biodegradable sanitary napkins-IP College for Women. Business idea for social cause: 13 projects selected for the 3rd round. 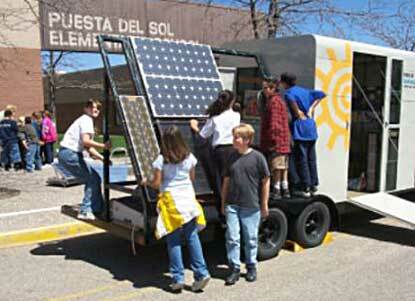 Students make food available to slum dwellers from hotels, hostels, restaurants, cafeteria, bakeries, event sites. Click on Mentor Walk icon above or these links for more information. 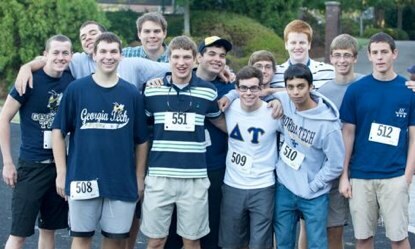 Mentor Walk expands from Georgia to South Carolina. Programs of the foundation continue to add meaning to students learning experience and entrepreneurship as they strengthen our communities. Thanks to our supporters and well wishers. Students from the following colleges apply for CASE. SRCC, IP, Miranda House, Dayal Singh, Hindu College, Khalsa College Hansraj, Jesus and Mary, ARSD, Indian School of Business and Finance, Guru Gobind Singh, Kirori Mal and others. 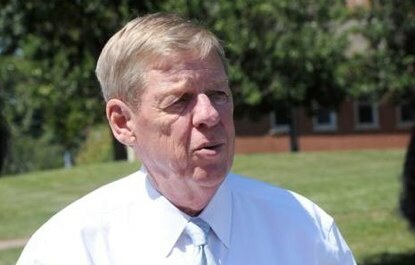 Mentor Walk addresses the dropout crises. Online registration for Mentor Walk 2012 is open. Students of SIFE at the Shri Ram College of Commerce in New Delhi are presented CASE Certificates of Merit and Disitnction for their academic service projects. Scheduled for Saturday, Sept. 15, 2012. More info. to come. Happy Holidays and a Happy New Year to our partners, participants and supporters! November 2011:Kayakalp Project wins a CASE Grant in India. Students at the Shree Ram College of Commerce in New Delhi revive the Puppetry Arts community and bring economic, education and health assistance to their families. 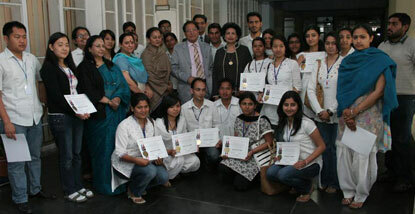 October 2011: Shri Ram College of Commerce, New Delhi, CASE-AIF Grant Competition winners selected. C2P receives praise from children, students, parents, teachers, community and state leaders for organizing its annual Mentor Walk. Letter of Support - President Jimmy Carter, Senator Johnny Isakson, Governor Nathan Deal, Ambassador Andrew Young...more to come. September 2011: Come help us address the school dropout crises! Become a mentor for students and parents! Participate in Georgia's first-ever Mentor Walk, with college students and other concerned adults to become mentors to secondary students and inspire them to finish school and attend college! Student wins the grant for building prototype housing for the homeless from a steel shipping container. 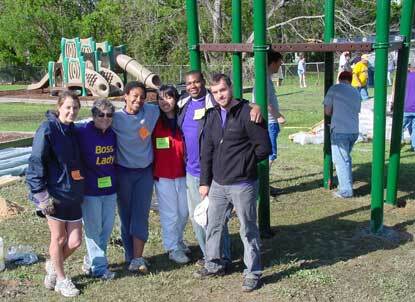 C2P featured for the National Volunteer Week by Shecky's. 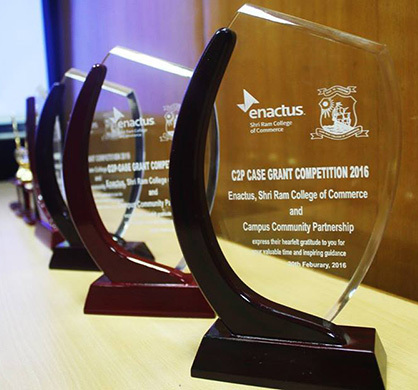 "Project Redistrict" in E-democracy has won C2P's CASE competition at the school. Student, Sheetul Hassan and her faculty advisor Dr. Rich Demillo would receive a Certificate of Merit and Distinction respectively along with funding from C2P from President Peterson of Ga. Tech. on May 5, 2011. 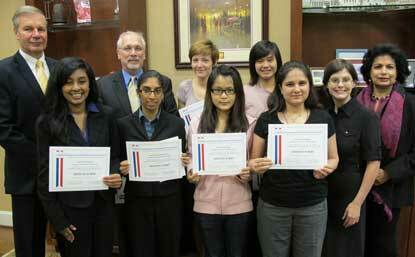 "Strong Sistas Mentoring Program" in partnership with Decatur High School has won the CASE competition at the college. 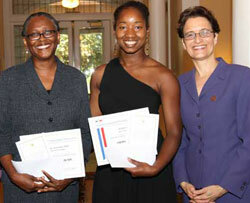 Kirnel Daniel and her faculty advisor Dr. Yvonne Newsome would receive a Certificate of Merit and Distinction respectively along with the funding from C2P by Dr. Elizabeth Kiss, President of the college on April 28, 2011. Dr. Elizabeth Kiss, President, Agnes Scott College has announced that the college would host the Inaugural C2P Mentor Walk on September 10, 2011 on it's campus to celebrate mentorship and mentoring programs. This would be the first Mentor Walk held on a college campus where college students would walk with school children on their campus with the mission of promoting mentorship and inspiring students to stay in school and finish college. The walk is open to public. More details to follow. 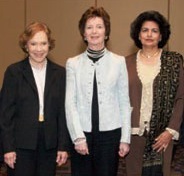 February 2011: International Conference of Civic Engagement in Germany. 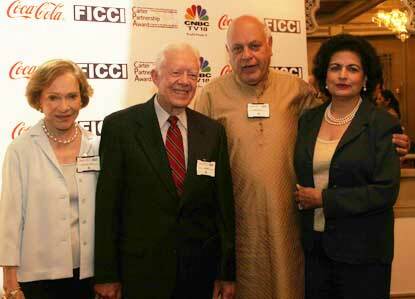 Dr. Sue Sehgal, President C2P is invited to speak at the International Conference of Civic Engagement in Germany where she will also introduce President Jimmy Carter to give his personal message for the conference. Christopher Huff wins the CASE Grant Competition for his proposal for Operation Uplift with his faculty advisor Dr. Peter Kower. CASE grant competition offered to Ga. Tech. students to recognize the most innovative and entrepreneurial community service projects linked to their academic discipline. CASE grant competition offered to Clark Atlanta University students to recognize the most innovative an entrepreneurial community service projects linked to their academic discipline. CASE grant competition offered to Agnes Scott students to recognize the most innovative and entrepreneurial community service projects linked to their academic discipline. CASE-KSU Competition is offered to students at KSU through the Center for Student Leadership, which seeks to be the benchmark for ethical leadership development at Kennesaw State University. CASE Grant Competition at Oglethorpe University recognizes the most innovative an entrepreneurial community service projects linked to students' academic disciplines. Proposals are due Monday, September 27, 2010 by 5pm. 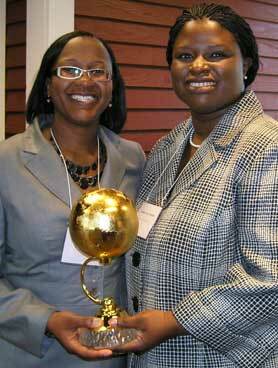 University of St. Thomas: Community Justice Project wins the Partnership Award in Minnesota. Law students, local youth, and disenfranchised community members address civil rights issues, increasing dialogue and improving relationships between law enforcement agencies and communities of color and to combat gang violence. See photo.on bottom right. Three finalists are: • Augsburg College's Campus Kitchen Project • The University of Minnesota's Cedar Humphrey Action for Neighborhood Collaborative Engagement (CHANCE); • The Community Justice Project of the University of St. Thomas School of Law, in partnership with the St. Paul chapter of the NAACP. June 2010 CASE Grant Competition in Louisiana sponsored by LaCC. CASE Winners from universities and community colleges across the state participate. C2P is pleased to announce a partnership with the Centre For Equity and Inclusion (CEQUIN), to offer its CASE grant competition to college students in India to be "entrepreneurial" in devising new and innovative ways to apply their class room learning to address diversity and women societal issues. CEQUIN (http://cequinindia.org/) will be the host organization for C2P's new CASE 4 W. Program Focus: dignity of women, capacity building, education, empowerment, economic development, nutrition; health etc. 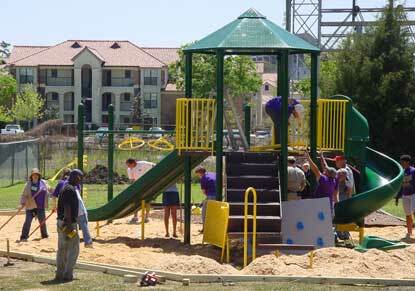 CASE, Engineering Design and Business Plan Model addresses a community need: A student at Univ. 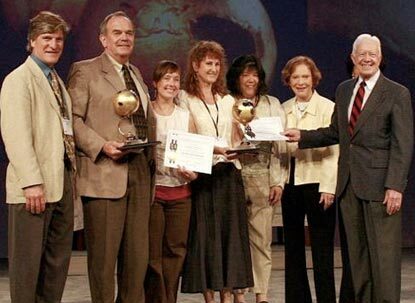 of Dayton, Ohio, builds a Solar Autoclave to sterilize medical instruments for remote village in South America with no electricity and creates local job opportunities. An Environment Project wins the Partnership Award: Watershed Stewardship Program at Portland State University included 112 community organizations, where 27,000 volunteers donated quarter million hours to install 80,000 plants and restore 50 acres of watershed along two miles of river. Individual projects are led and supported by 700 students working as part of their class projects and so far have resulted in two master's theses and three research articles. Dr. Dan Papp, President KSU with CASE winner, Travis Allen and faculty advisor, Dr. Gary Roberts. Dr. Alvetta Thomas, President Atl. Tech. with faculty advisor, Kenneth Swain and CASE winner Jim Cersosimo. 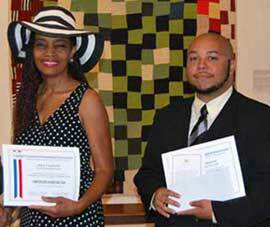 Jeremy Simmons a Music Major and faculty advisor Ms. Juliet Anderson are presented the CASE certificates of Merit and Distinction. 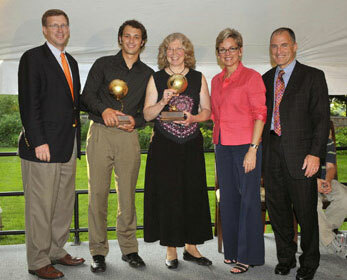 President Bud Peterson, CASE Student Team winners, Dr. Rich DeMillo and Dr. Sue Sehgal. President Elizabeth Kiss with Kirnel Daniel, CASE Grant Competition winner for "Mentoring Project" and faculty advisor Dr. Yvonne Newsome. 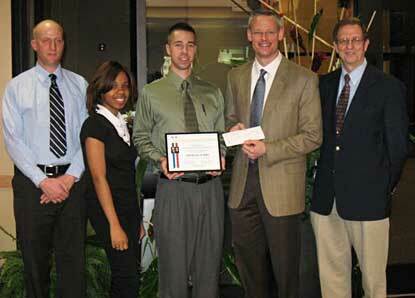 CASE Grant winner Ben Minor with President Lawrence Schall of Oglethorpe University and Dr. Bob Heightchew, Ex. Dir, C2P. 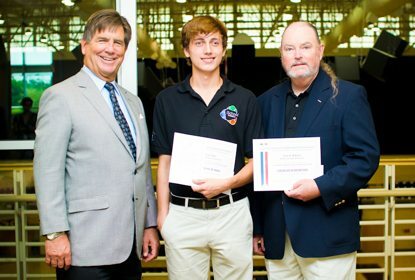 OU President Larry Schall and CASE Competition winner, Christopher Huff at Oglethorpe University for "Project Uplift". 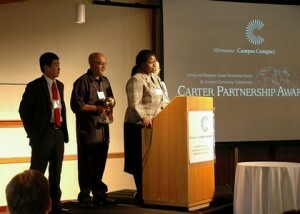 2010 Carter Partnership Award in Minnesota is won by University of St. Thomas School of Law and, the St. Paul NAACP. Grand Valley State University and Westown Juliee Housing Partnership. Energy efficient housing for low income families in Grand Rapids, Michigan with Governor of Michigan, Jennifer Granholm. 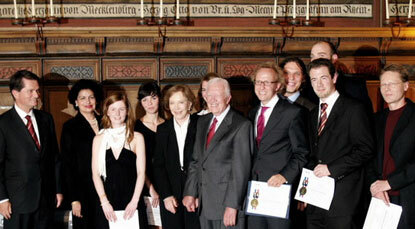 Dr. Rolf Bartke, Dr. Sue Seghal, Mrs. Rosalynn Carter, President Jimmy Carter, Dr. Sascha Spoun, President University of Lüneburg with students. Award won by St. Agnes College, Mangalore for Rainwater Harvesting Program. 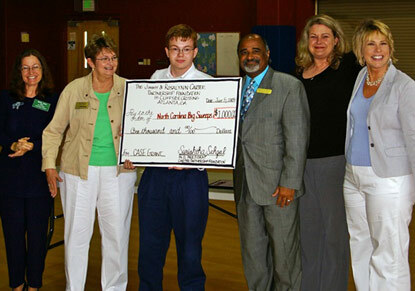 Student grant winner, Kenny Collie with Community partners for the Little River Restoration Project at East Wake Academy, North Carolina. Students, Baber and Ryan, Academic Service Entrepreneur winners at the London School of Economics. 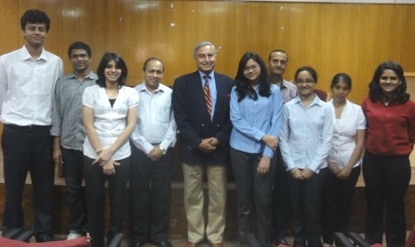 Student winners of Academic Service Entrepreneur Grant, 2009, Panjab University. 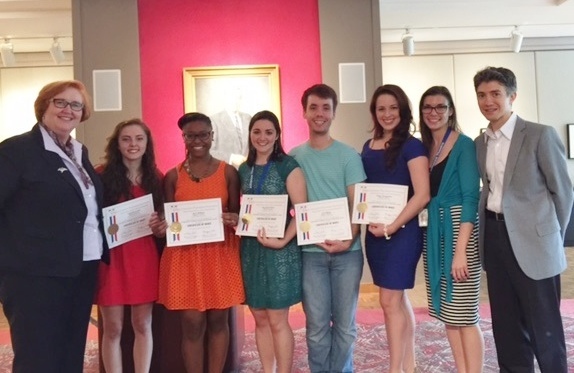 Students winning projects from Germany, India, South Africa, South America, UK, and the US. Hydraulic design and a water treatment plan to supply portable water in areas with unsafe drinking water. Student using robotics to expose inner city students to science and mathematics. A solar-powered autoclave sterilizer developed by a mechanical engineering student for a remote village which does not have electricity. Developing an art project to address the emotional needs of children in homeless shelters. Student engaged in a micro finance project to help a developing community keep it's capital in the local community and helping to make it grow. College student teaching reading skills to elementary school children and serving as a mentor. 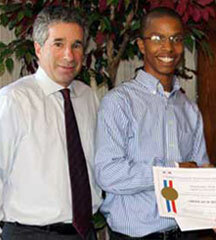 Student helping inner-city youth to develop employment skills. Students engaging others in increasing recycling on a campus and neighboring communities by creating awareness ("sister recyclers"), installing appropriate bins, monitoring collections etc. 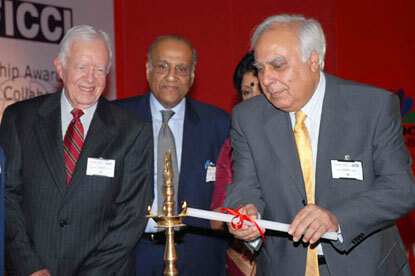 India's Minister of Higher Education, Mr. Kapil Sibal, lighting the ceremonial lamp at the Partnership Award event. 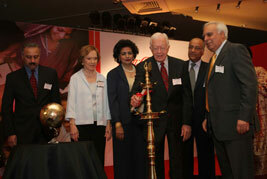 India's Minister for New and Renewable Energy Mr. Farooq Abdullah, President & Mrs. Carter and Sue Sehgal at the Campus Community Partnership Award event in New Delhi. 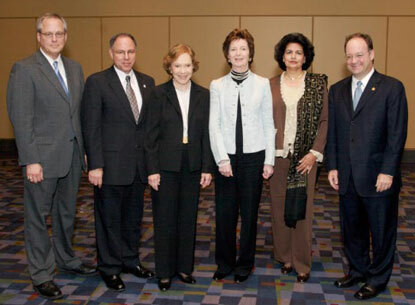 President Timmermans; President Goldfarb; Former First Lady Rosalynn Carter; Former President of Ireland, Ms. Mary Robinson; President Campus Community Partnership Foundation, Sue Sehgal; President DeGioia of Georgetown University. 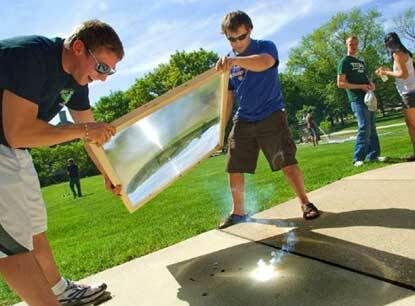 Students in Experimental Physics class use a giant fresnel lens to focus solar heat at Illinois Wesleyan University. 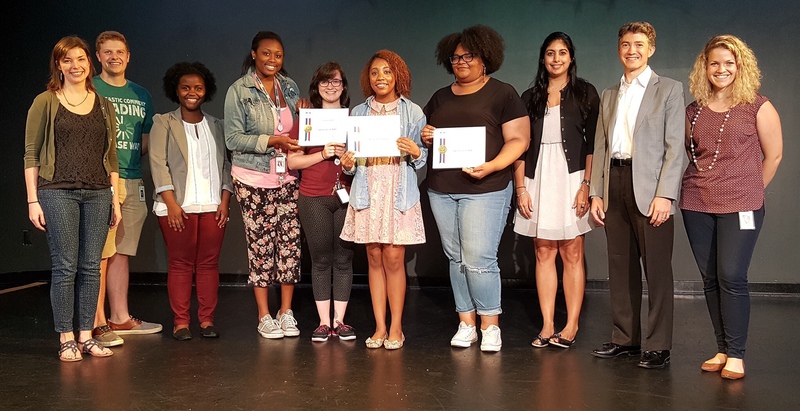 Students and their community partner with Certificates of Merit and a check to implement their project in a community in Illinois. Student projects involve renewable energy, solar physics, model wind generators, PV powered boats and cars, and even a solar balloon. Many of the resources linked from this web site are not maintained by the Campus Community Partnership Foundation (C2P). The Foundation is not responsible for the legality or content accuracy of information on externally linked sites. External links do not constitute an endorsement by C2P of the opinions, products, or services presented on the external site, or of any sites linked to it.